One of the best things that has happened to me over the past year is the introduction of Sous Vide Egg Bites at Starbucks. Perhaps you've seen them? They come in a beautiful package of two, available in Roasted Pepper Egg White Bites and Bacon Gruyere. Why do I love these things? SO many reasons. They are low in calories (especially the egg white version), convenient, relatively inexpensive, a full meal for breakfast or lunch (at least for my 5'2" self) and pack a powerful punch of flavor. As a cook, the main reason I love these bites is that Starbucks has boldly introduced this relatively unknown cooking technique of sous vide to the masses. When it comes to cooking, when I find something I love - a tool or a recipe - I want to share it with everyone I know! So thank you to Starbucks for helping to validate my evangelism of this cooking technique. By definition, sous vide is a method of cooking in which food is sealed in airtight plastic bags then placed in a water bath or in a temperature-controlled steam environment for longer than normal cooking times—96 hours or more, in some cases—at an accurately regulated temperature much lower than normally used for cooking, typically around 55 °C (131 °F) to 60 °C (140 °F) for meat and higher for vegetables. There are several sous vide cooking tools on the market, but if you've heard of this then chances are that you are familiar with two of the most popular, Anova and Joule. Both deliver a similary end product, but the Joule actually syncs up with the Alexa, so if you like to geek out when you're cooking, then you can really double your pleasure with the Joule. Everyone thinks that sous vide sounds difficult to do or too time consuming, which I get. In this era of pre-made meal delivery kit services like Blue Apron or Hello Fresh, why bother? But I promise, sous vide cooking is like riding a bike or learning to do anything else. Once you get the hang of it, it's a piece of cake (sous vide cake, can we do that?!) and you will want to begin experimenting. The flavor that you are able to create by locking in a food at a certain temperature is worth the investment in money and time. The Joule app has recipes for a variety of proteins and veggies, and for all of you Whole 30 fans, a whole category of recipes just for you. Janelle, Director of Business Development at a tech startup. "We use our sous vide at least once a week. Definitely every Sunday to cook a bunch of chicken breasts, it makes it easy to pack a lunch every day and put it on salads and stir fry at night. With two working parents and two kids, we have very little time to cook and the fastest, best tasting, healthy food is pre-cooked meat. We love how tender the sous vide makes chicken, so all I need with it is a side sauce/condiment like salsa or Dijon. We used to use slow cooker recipes, but it left chicken dry, and the sous vide solved for that. Another plus of sous vide is that when guests come to dinner, it gives us time to chat and hang out without having to worry about fussy prep work." "As a health conscious working mother, I put a lot of thought into meals as well as teaching my two boys what eating healthy means. My sous vide machine helps me cook healthy, and the unique cooking method appeals to my young boys sense of curiosity. We’ve prepped many meals together, but most frequently we sous vide blended egg, cottage cheese and pancetta in bulk every Sunday. A small mason jar makes for the perfect sous vide container, the size allows for a simple single serving, and you can easily make enough for a week of breakfast servings. Healthy, tasty protein; boys are engaged and active in meal prep; and a cute serving dish. What more could a mom want?" Whether you're sold on sous vide or still need convincing, I encourage you to check out ChefSteps on Instagram for more inspo, or even better, download the Joule app to see just how simple it can be to get your sous vide on. P.S. Thanks for visiting, Team ChefSteps! 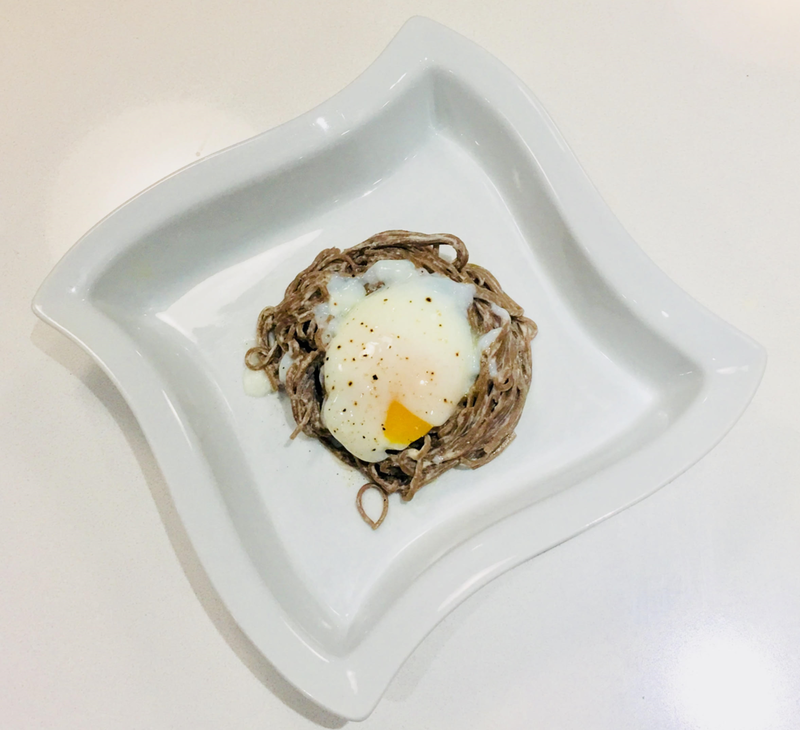 Sous vide poached egg atop of soba noodles in tahini sauce AKA an Asian Birds Nest.